1: mercier creates for its mopeds a frame with a particularly stiff and robust cradle. 2: rhonson assembles a moped with a swing-master suspension of palco type. 3: colomb exhibits a "professional" machine, equipped with the new campagnolo derailleurs; here is the left rear dropout showing the threaded adjusting screw. 4: motobecane presents a scooter with a very stylish handlebar speedometer. 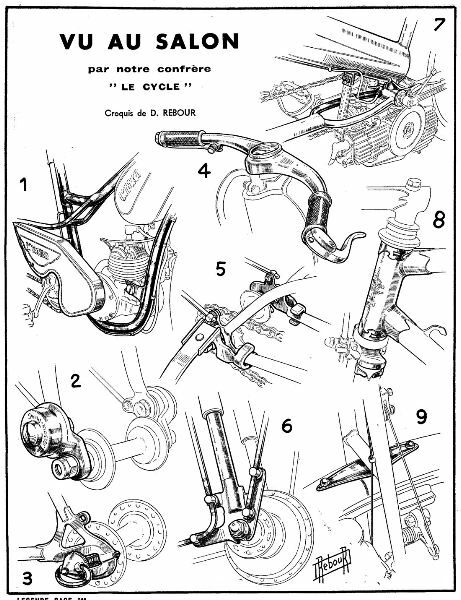 5: lutetia is a specialist in chidrens bicycles; here is a study of the rear dropout, with fender eyelets, raised by the mounting of training wheels. 6: peugeot studied for the bima luxe, this original dropout for the telescoping suspension fork. 7: singer innovates for their debut in motorization. see here their tandem frame, equipped with a mosquito. 8: beistegui for its racing model, present this beautiful headtube(? ), decorated with 2 removable cut-out chrome-plated rings. 9: herse reinforces the attachment of the rear mudguard with this long strip.